Audio quality - especially over Bluetooth -- left a great deal to be desired, and AirPlay 2 is still MIA. AirPlay 2's unavailability right now is not at the fault of First Alert, and is instead on Apple for delaying it significantly from its expected launch alongside iOS 11. That said, it remains to be seen when the firmware update for AirPlay 2 will arrive. I bought an first alert and a nest at the same time. The first alert broke down twice within six months , the first time I had it replaced and the second time I threw it out . Most importantly, how well does it work as a smoke detector? Does every little wisp of smoke or smell set it off? Some First Alerts have 2 stages so for example, if its someone burned toast it doesn't set it off, but if it senses legitimate smoke it goes off as it should. I'd much rather have this than some gimmick speaker in it. First and foremost, it should function very well as a smoke/CO2 detector. Can Alexa be disabled? And can you be sure she's off? Don't really want Amazon listing outside my bedroom door. In our end of the valley we get episodic power outages. Absent a $6500 Tesla Powerwall , that leaves a window of vulnerability which I have managed with battery-operated Nests and an UPS for the WiFi set up. It does not appear this device has that option. What about privacy? I don't want Google or Amazon listening to everything that's going on. They should release a version without the speaker and the microphone. I would buy a few then. The combo of smoke detector, CO detector, and night light with HomeKit integration would be sufficient. If they could also integrate a motion sensor, that would be great. There’s no need to place a speaker and a mic in every device. No mention of privacy or security? What data is collected? How is it used? Can I turn off Amazon functionality? Do they sell a version without speaker? Could they have come up with a longer, more pretentious-sounding name for the thing? And who wants to stream music through their smoke detector??! NFW it's going to sound even half-decent. Maybe listening to a ballgame or some other non-music content MIGHT be tolerable, but it's a joke to suggest that anyone who can afford this thing wouldn't somehow have much better options on hand for streaming music. "One of our favorite features is the ability to hush the alarm in the case of accidental triggers. Imagine you're in the kitchen and a pan is putting off a bit more smoke than you anticipated. As it should, the smoke alarm starts to sound, amplifying an already frustrating situation. Luckily, the Safe & Sound can be quickly and temporarily hushed using the button on the side..."
I'm tempted by this, as I am the Nest - but I just can't justify the outlay in replacing all of my smoke and co2 sensors. I think at last count I have at least 12 throughout the house, although none in the kitchen strangely. I would happily exchange alexa/voice control for enhanced sensors - air quality, humidity etc. - that's personally more important to me in smart devices. The silence button on the side rather than centre on the front is a negative for me - if you have high ceilings, you would normally use something to prod the button (I use one of our sash window openers), a side-mounted button would involve getting out a step ladder!! edit* - re-added the line breaks which always disappear. Agree! 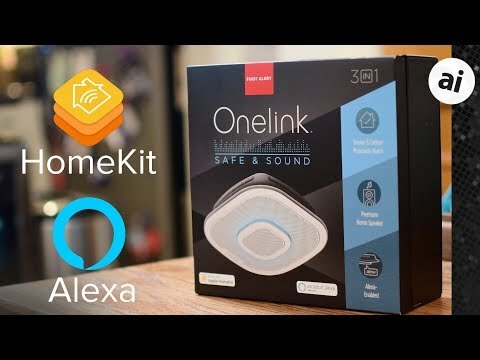 Why can't we just have a simple smoke/CO detector with HomeKit support? I don't need all of this crap that just raises the price of it and creeps me out because you never know when its listening. God forbid companies make something with freaking Alexa inside it. This is like the new fad these days. I don't need to tell it anything, I don't want to play music through my smoke detector, I don't even want the blue light around it. I just want a simple smoke detector that does a really good job and alerts me on my phone which one triggered it so I know which one to silence, or where its went off in the case of no one being home. Maybe have set so it knows when nobody is home and calls 911 (or whatever it is in your country) automatically. It can be silenced by a button on the side? That’s actually a downgrade from the regular smoke detectors I have now, which have a button on the bottom. For anyone not tall enough to touch the ceiling, a button on the bottom can at least be reached with the assistance of a wooden spoon, or a stick or something. The button on the side is going to require climbing up on a chair or stool to reach it, which just increases the likelihood of accidents that will delay completion of the dinner smoking on the stove. Alternatively, while the alarm is screaming at you, you can fumble around on your phone, open an app, and silence it from there. Sounds to me like there’s more work needed on this item. This side-button is a very non-Apple kind of engineering design, if you ask me. The rest of the quote after the ellipses is or the app on the phone in your pocket. I read the listing on Amazon and it has a built-in 10 year backup battery. I think they addressed that pretty well. Most smoke detectors today have a 10yr lifespan. If they don't, then I wouldn't buy it. The actual sensor degrades below acceptable levels after ten years, and then the random false alarms start happening, but only during the hours of midnight and six a.m., which is pretty remarkable for even non ‘smart’ devices that don’t have any sort of clock in them. Seriously, though, it’s because of this that a long-term built-in backup battery is actually mandated to not work longer than ten years. The sensor is less reliable, so a twenty-year battery isn’t allowed, because it would motivate owners to keep using the devices beyond the reliability factor of the sensors. I’d be more interested in the reviewed product if it had a version without Alexa spyware, without the added expense of the music feature (I already have HomePods, which surely sound way better than smoke-alarm Muzak), and a false alarm silencer button on the bottom of the device, where you can actually get to it with a stick or kitchen utensil without climbing on the furniture. My significant other is tolerating my rollout of HomeKit stuff but would probably just go ahead and burn the house down with me in it if told that silencing a cooking-induced alarm would now require opening an app on the phone left out in the car, a conversation with Siri made more difficult by the screaming smoke alarm in the background, or by climbing on the furniture to push a button inexplicably located on the side of the alarm, an action that probably invites hearing damage by putting the user’s head inches away from an alarm blasting at probably 120+ decibels at the source, just to reach up and push that side button. Two things. In my testing, it did a decent job of not going off in the kitchen. The cheapo Kiddie smoke detectors I had before went off at the slightest smoke. In this case, they seemed to not be triggered so easily. That is really useful. I also wanted to say that the speaker is FAR from gimmicky. This is a legitimate enhancement. It isn't like taking a good product and just sticking something that doesn't really belong there. Honestly I want more of these in my house. The ceiling is the perfect spot to be putting a speaker, and it was so easy to install compared to other in-wall speakers. It should be noted that, while the smoke detector function is likely as useful as any other smoke detector, the carbon monoxide detector is likely useless. This is because carbon monoxide is heavier than air. Carbon monoxide detectors should be installed near the floor, not on the ceiling. This is incorrect. First, carbon monoxide is actually slightly lighter than air (vs. carbon Dioxide, which is heavier), and more importantly, gases mix in a room, so that CO is easily detected at the ceiling. The fact that many reputable detector companies (NEST, First alert, etc.) make combined CO Smoke detectors (all of which must be ceiling mounted for smoke detection) illustrates this. I did not include links, but a quick google search will verify this and refute the common held myth. While the detector itself seems interesting, I am happy with my NEST Protect detectors which link to my Nest thermostats and each other, and are easily controlled on my iPhones, iPads, and Macs. They have motion detectors for the built-in night lights (which have three levels of dimming), test themselves periodically and let the thermostat know if someone is home. (If not, the Nest thermostat can change heat settings to "away"). I would like it ifthey were HomeKit compatible, but they work well. (And they link to my Harmony smart remotes as a bonus). I don't need the speakers in each room, and am not interested in adding Alexa to my smart home. The ten-year sensor lifespan is for Americium-based ionization sensors. These appear to use photoelectric sensors, which are much more expensive, but have a much longer usable lifespan (tens to low hundreds of years) and are largely immune to false positives. You are describing the Nest albeit without HomeKit but at least the night light has a sensor on it! It is the added features that put me off...who on earth wants a speaker and voice assistant in a smoke alarm?